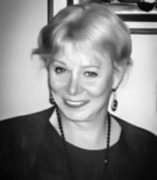 Deirdre McCloskey is an economist and economic historian who around 1980 got interested in the rhetoric of persuasion in her field, and then wider literary matters, such as literary and social theory. Her main project during 2003 and probably some of 2004 will be finishing a big book called Bourgeois Virtue. She is a free-market type, and so the book is technically speaking an apology for capitalism. But she tries to be fair! Among other methods (economic, historical, philosophical) the book examines numerous literary examples of the ideology of the middle class, 1600 to the present in Europe and its offshoots. After this big book she will do a little one for Blackwell's called Economy, making a case for an economic criticism. In the longer run she intends to write another big book called Language Matters: The Linguistic Economy, which will try to bring speech into economics (surprisingly, it's not there now). An economy is not "merely" a matter of language; but a great deal of it takes place on lips and pages.